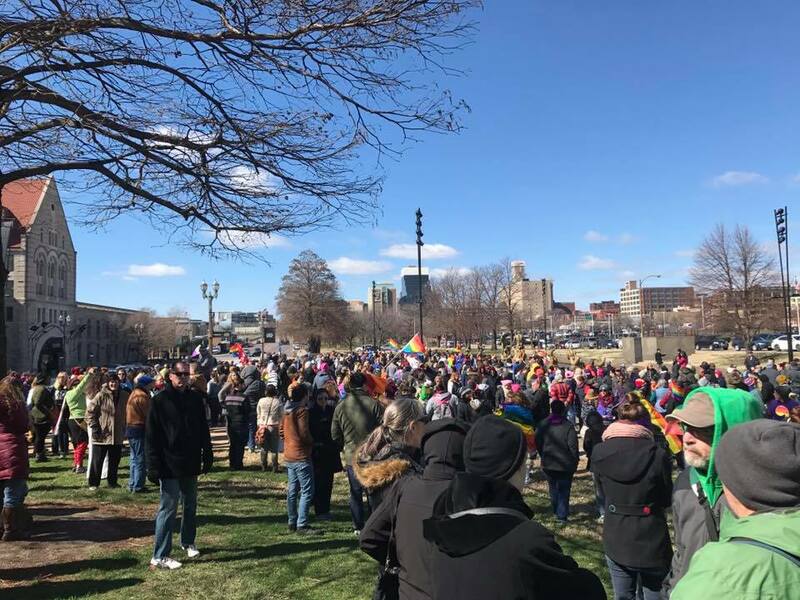 On Saturday, February 25 there was a fierce LGBTQIA march in downtown St. Louis. We gathered in response to Trump and new Missouri legislation targeting queer and trans folks, specifically trans youth and where they may or may not use the bathroom. But there are many other reasons that brought us out that go beyond Trump or the bills of politicians. By the end of the march three folks were arrested and brutalized when police had the audacity to lay their hands on the crowd. The day started with a mix of over 1,000 people gathering across from Union Station. After speeches, the group headed towards the Old Courthouse. 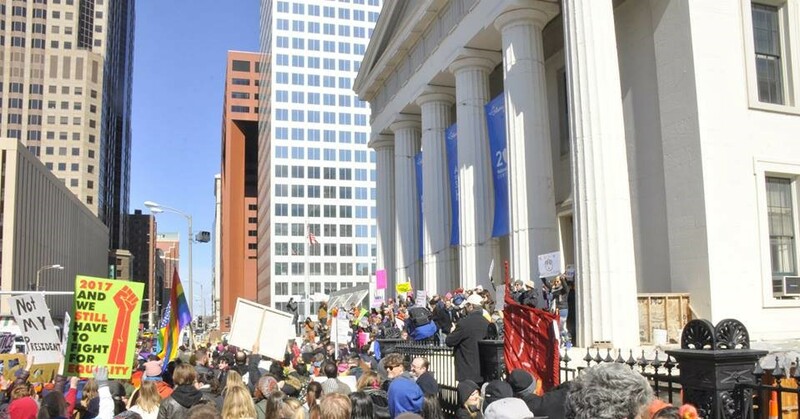 The SLMPD was already overstretched from dealing with drunk bros at Mardi Gras and the march certainly didn’t help. We congested the little bit of already congested downtown traffic, and tried unsuccessfully to storm the Old Courthouse where slaves were once sold. At this point, the event had achieved its stated route by a few blocks. Between that and perhaps a perceived lack of focus or shared affinity and militancy, only about half the march continued snaking through downtown. Over the next couple of hours we somersaulted and jake-braked into the convention center (The “Dome”) slightly disrupting both a gymnastics conference and a national passenger bus carrier convention (funny conferences, we know, but we take what we can get! ), as well as briefly blocking the Eads bridge, one of the smaller bridges between St. Louis and Illinois. By the time we were on the bridge, the march had dwindled to an energetic group of 100-300. As has been the pattern the past decade or more, the police kept a distance from us for most of the march: often escorting the march, and biking or driving ahead to upcoming intersections to stop traffic. It’s a clever game with set parameters, which if we exceed can quickly show the police’s true colors. Around the end of the march, there was a ten-minute period where the police—either tired of our “disrespect” or reacting to some perceived assault—arrested three folks, including two trans-women. We didn’t want those who got grabbed to get arrested, so chaos ensued as we surrounded the police to free our comrades—each side yelling obscenities, pushing each other and playing a bit of tug-of-war. The police soon found themselves surrounded by a cacophony of noise and jabs making it hard for them to do their job in peace. One officer even found themselves pinned face-down under their own bike, with no one to blame other than themselves. The police were forced to huddle up their bikes and bodies around the arrested. When they tried to pull comrades to vehicles, we surrounded them again and stood in front of them. Eventually getting folks in the cruiser, cops had another problem of having to constantly push people out of the way of their car’s path while others of us ran to be a fresh line to block them. The cop cruisers strained, having to inch and lurch forward until they could floor it out of the crowd. Each car that was transporting comrades were forced to speed off—one cop didn’t even have time to get in the car and was forced to stand on the step of the SUV. Bewildered bike cops, the bulk of the police force monitoring the march and taking part in the arrests, sped off as soon as the last comrade was taken away. For those arrested, the brutality didn’t stop after being beaten in the street. In the jail, the police and COs continued to harass and mis-gender the arrested comrades while in custody. They were forced to strip and be searched, as well as threatened to be thrown in the drunk tank with all the Mardi Gras bros. This is nothing new when it comes the antics of the police and COs. They always make clear that no matter their lip service about LGBT inclusion, the true colors come out when we find ourselves in the belly of their beast. Saturday was likely a new experience for many involved, and we encourage those who attended to think about what the police, jailers and judges are capable of when we come up against them. It’s also important to celebrate what went well and plan for how things may go more smoothly in the future. Hey Miranda, thanks for bringing this up. We’ll be sure to add that info into the account. It seems important to keep the account about the crowds reaction to the police. Folks did not want to see friends and comrades go so easily. In those terrible moments, it was beautiful how much we cared about their safety in the hands of the cops. It feels critical to promote this ethic, to not let them touch us or else. This situation also happened with success during one of the anti-Trump protests in November the day he got elected. That day a critical mass of people surrounded a police van with someone in it, eventually forcing them to free him. Of course, we should not diminish the brutality of the police, but neither we shouldn’t diminish our self-defense against their brutality. 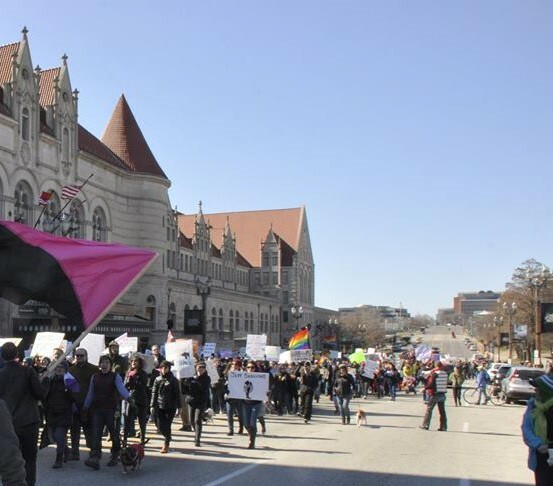 The publicized route for the march was Union Station to Tucker & Market, so actually the march had achieved its stated route long before they got to the Old Courthouse, but otherwise a great write up of the event. You should remove the part about what we protestors did in response to police. Instead, focus on the BRUTALITY of trans women. Trans women in custody were forced to STRIP in front of MALE officers. They threatened to throw our comrades into the same cell as drunk men from Mardi Gras! The police repeatedly misgendered these young women.